Ultra Tred Waterborne Epoxy Gloss Enamel is a highly durable, abrasion resistant, catalyzed coating. 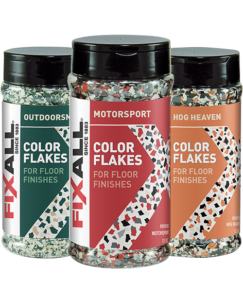 It resists hot tire pick up when applied to a properly prepared, profiled garage floor. This two-package coating is available in a full range of bases for tinting and two standard gray colors. It is resistant to common household stains and its chemical and solvent resistance properties are superior. Ultra Tred is designed for use on new or previously painted interior concrete floors, masonry, wallboard, plaster, fiberglass, wood (not hardwood floors), treated galvanized metals, steel, aluminum. It can be used on garage floors, manufacturing plants, schools, hospitals and chemical handling facilities.